This charming small coastal village on the eastern coast of the island is located 24 km away from Thassos Town and approximately 42 kilometers from the port of Skala Prinos. It’s the kind of place that can easily capture your admiration and convince you that should be reviewed again. He is among the quietest of Thassos and its natural beauty you can take your breath away. 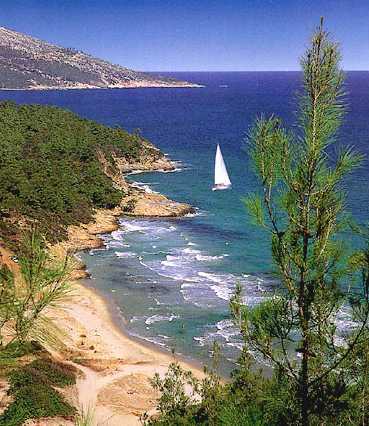 Just off the coast of the island is Kinira, which adds much to the beauty of this part of the island of Thassos. Kinira has a rich history that dates back to the Phoenicians. Kinira over time was known as “Aenyra” and “Coenyra. It is now known as “Loutrou” by locals. The beach is not crowded, but crystal clear water and quiet, makes its acetate instead of being special. Near it there is the Paradise Beach.